Chris White at Lawnewz.com offers a piece on prosecutor Marilyn Mosby's once again accusing Baltimore police of a crime without any evidence. When Baltimore State’s Attorney Marilyn Mosby spoke about the death of Freddie Gray during a press conference last year she was widely criticized for making many inappropriate remarks. She appears to have learned nothing from that experience over the past year. On Wednesday, Mosby was back in front of the cameras where she made extraordinary shocking allegations against the Baltimore Police Department, again. 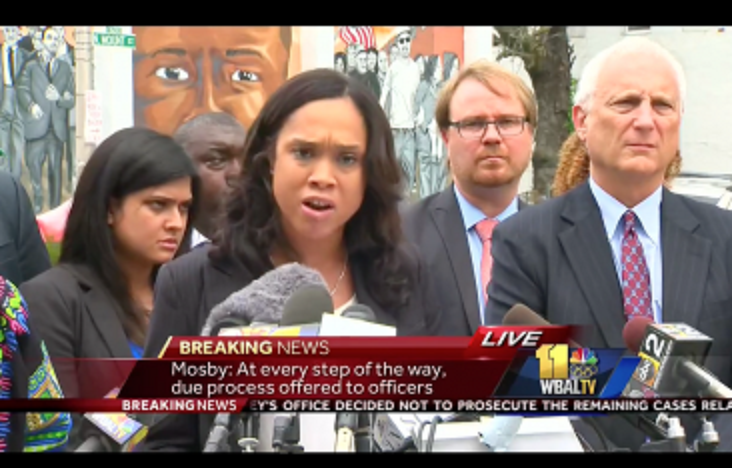 A defiant Mosby refused to take any accountability for her rush to judgment in charging the six police officers just over one year ago. Instead, she chose to blame the Baltimore police investigators for her inability to sustain a single criminal charge against the accused officers. Mosby accused investigators of intentionally trying to harm the state’s ability to bring charges, even going so far as to claim investigators committed a felony by manufacturing evidence in the case. Yes, that’s basically what she said. The ethical, professional, apolitical lawyers who work for her in the city attorney's must be so-o-o-o-o happy!